If you don’t have much experience of racing, please volunteer for Assistant Officer of the Day duties and you will be paired with an experienced Officer of the Day. Junior members are not expected to do any duties, but any juniors who want to help are very welcome to get involved. If you do a lot of racing you should volunteer for at least four duties. If you don’t race much (or at all) please can you please volunteer for at least two duties. and he will try to organise a replacement. This week sees the start of the Club's evening sailing programme. On Wednesday (3rd) we have our first evening race of the Season and next Tuesday (9th) our ever popular Tuesday Night Training and Come and Try Sessions start. Plus if you want to help out with the Training Sessions please speak to Andrew, help is always appreciated ! Look forward to see lots of people down on Tuesdays and Wednesdays. After all the 90th Anniversary celebrations last season our 91st Sailing Season starts this Saturday with the first Series race starting at 2.30pm and the second race at 4.00pm. With the weather disrupting the pre - season working parties there was a mild panic on Sunday when it was realised that No 7 had gone walkabout. It was found later hiding in a bush at the side of the Tarn which would have made rounding it rather interesting ! Luckily Graham came to the rescue and managed to retrieve it mid-week, so big thanks to him ! It is our 91st season but it is the first season for the new Fishing Club operating on the Tarn - Yeadon Tarn Angling Club 2019 so best of luck to them and looking to contine the good relationships and joint initiatives of the last few years continuing in the future. The new Bailiffs are Jimmy, Reece and Ste. So come along for the start of the new Season, the weather is forecast to be quite pleasant (for March), see the new decking, get out on the water and enjoy the Tarn. I am just finalising arrangements for our annual Laying up Supper at Otley Court House this Saturday 26th January. It promises to be a great round up of the sailing year and I hope as many of you can join us as possible. There will be a prize giving, fish and chip/veggie option supper, a bit of fun entertainment and a raffle.....add to that laughter and some lively chat. There is a bar to buy drinks also. And don't forget to bring a cake for the Bake Off competition if you can - Sailing themed or otherwise ! 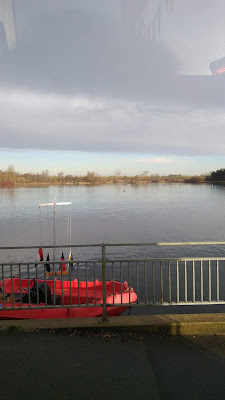 The Annual New Year's Race was held in glorious sunshine and from a spectator's point of view a reasonable breeze (the racers found it a bit variable in places but that is the nature of sailing at Yeadon !). Sarah and Bryan officiated the day's proceedings and a good number of members took to the water for the Race. Tony showed everyone the way in his Solo with Tim sailing a Club Heron led the slow handicap boats. Meanwhile as the race went on many Club members gathered to spectate and to partake in the post race Fuddle. 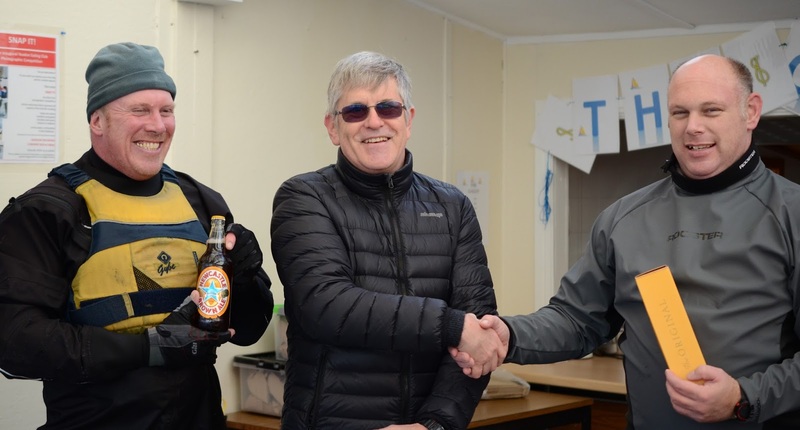 Unfortunately I left before the Commodore's Bottle was presented to the winner but the view was that Tony had done enough to win the Race but we shall see when the results are published ! We have had an invite from Ripon SC, see below, for any Topper Sailors to join in their Topper Training Day on the 26th January. If you want to know more please speak to Andrew or any Committee member or just sign up via the links below. 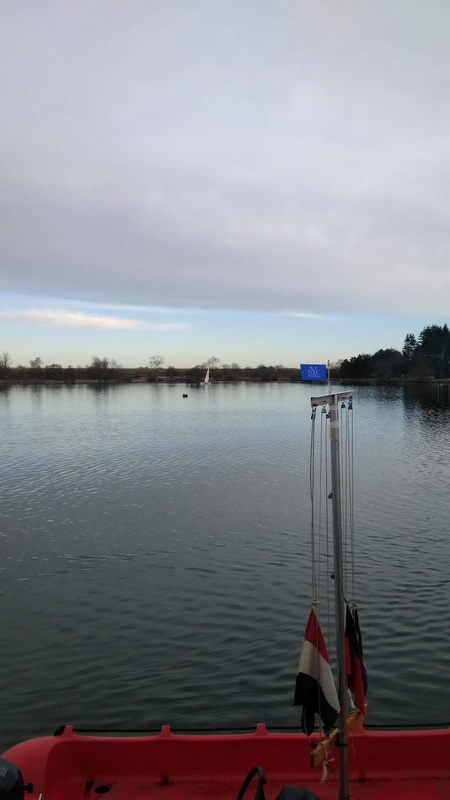 Ripon SC is hosting some Topper Training on Saturday 26 January. This training is aimed at beginner / early racers and will focus on improving basic racing skills, Topper set up and key Topper racing info. It is being run by the Topper Class Association and will be coached by Lucy Mearns. I will be grateful if you can please circulate this email to any Topper sailors at your club. I look forward to seeing them at Ripon in January. It will start at 9.30am and run until about 4pm. The session is £22 per person and you need your own Topper. The galley will be operating and will have a selection of hot meals at lunchtime plus the usual teas, coffee and cake. 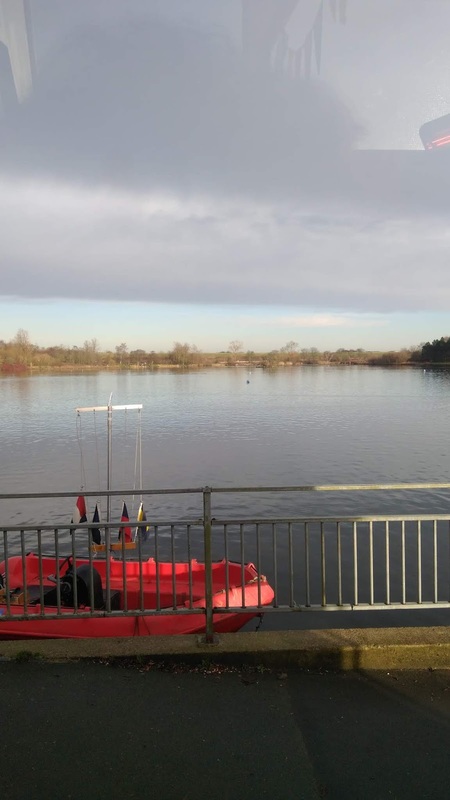 For those of you who haven’t been to Ripon SC before, our water is excellent for winter training as the training area is minutes from the launch area, you can stay dry whilst launching & recovering boats and we have excellent changing facilities and a warm club room for parents and supporters. I hope sailors from your club will be able to attend. This session is a great way to get some top tips and encouragement during the winter season so you are all ready to go when the racing circuits and club racing start up again in Spring. 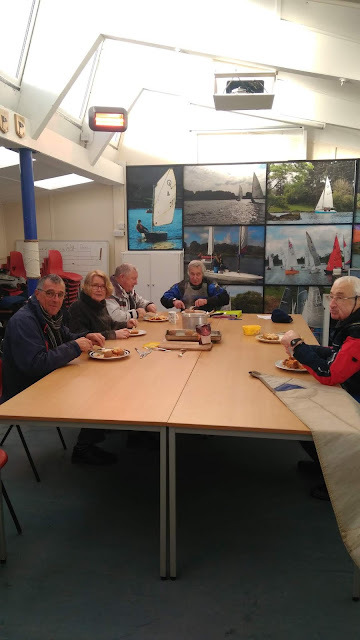 This session is aimed at the “just starting to race / got a season of club racing under my belt” sailor, the focus being very much on those who are interested in improving their racing, boat set up, and would like to build their confidence to progress on to traveller events and beyond. This is a new pneumatic trolley wheel, still as bought, 360 mm diameter, fits 13 or 25mm axle, cost £18 new, not needed, to a good home only £14. Happy New year if you don't make it up to the Tarn on New Year's Day. Just to remind you that the 2019 Season kicks off with the New Yerar's Day Race and Club Fuddle on (not unsurprisingley) the 1st January. The race attracts the keen and hardy, whereas the Fuddle gets a better turnout of members down to welcome the New Year in ! The race starts at 12.00 so please be down in plently of time to get lots of warm sailing gear on if you plan to sail. The Fuddle generally starts once the sailors have come off the water, sometime between 12.30 and 13.00 depending on how cold it is ! It will be great to see lots of people down either sailing or supporting and spectating, and if you can bring some food with you to contribute to the Fuddle that would be good too. The weather forecast for Tuesday is currently looking reasonable for this time of year so fingers crossed for a good day ! The 2018 YSC racing season coincluded on Sunday with the completion of the Frostbite Series. This year the Forstbite Series has been closely contested this year with lots of people sailing and a number of boats in the running to take the overall Trophy. Unfortunately it went out in a bit bit of a whimper ! 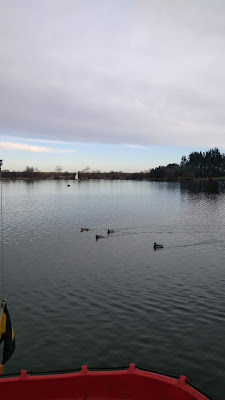 The day before we had strong winds followed by freezing rain which was horrid and only the really keen turned up for the race and were met by millpond conditions. A race was held but the reduced field struggled to finish a lap and John the OOD finished the race on the water rather than at the Club line. Overall David in his Laser won the Series (8 pts), Graham was second (9 pts) and Phil was third (10 pts) so it was very close indeed ! It was especially pleasing to see a number people stepping up from the training sessions, getting involved in the racing and getting the necessary number of races in to qualify for the Series with Richard E in 5th, Dominic in 6th (and 1st Junior), Chris S in 8th and Richard B in 11th. Well done to everybody who sailed ! The next race is the first race of the 2019 season on New Years Day, along with the fuddle. 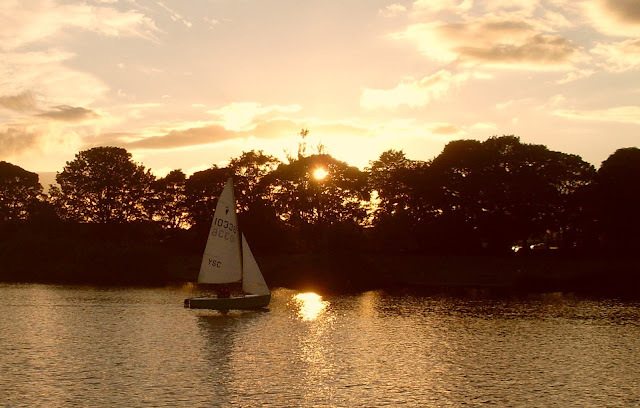 Come and sail, or do like most members come watch the race and socialise ! It doesn't look exciting !